Sometimes you find yourself saying “I need money now!” There could be a number of reasons, but you need to get money today and you’re asking, ‘how can I make money fast?’. Ideally, you would have an emergency fund to take care of such situations. That was the situation we faced this past winter. We had a pipe burst and faced a $2,000 repair bill. Instead of making a claim on our homeowner’s insurance we paid the repair bill out of our emergency fund. Unfortunately, we don’t always have a rainy day fund to fall back on. That was the case for me while paying off debt. A surprise bill came through, and I was forced to figure out how to make quick money. You may need to make money fast because you want to buy concert tickets or because you want to pay off some lingering debt. Thankfully there are many legitimate ways to make money quickly. We’ve listed 25 ways to get money quickly regardless of the situation. Some of the ways help you get money today, while others may allow you to earn money in a week or two. We’ve also listed five ways not to pursue if you need to get money now. There are many out there that will prey on your need, so it’s best to avoid those “opportunities” as they may make your situation worse. Many of the ideas below can work to help you create a good cash flow to help your current situation. The other quick ways to get money may just help in a pinch and not truly be a good, long-term way to make extra money. Find an opportunity or two that works with your strengths or situation and use it today to start bringing in some additional income. There are many ways to get money fast. Unfortunately, not all of these ways are reputable or reliable. A few of these quick ways to make money now do require a bit of specialized skill. However, many require little to no skill whatsoever and should be achievable for many. If you need to figure out how to make money fast, here are 25 ways you can start right now. When I first started paying off debt, I pawned a number of items to get cash quickly. This provided money I could use to help pay a bill and provide a little relief. I pawned my TV and other items around my apartment I was not using on a regular basis. Just make sure not to pawn items that have sentimental value to you. For example, I pawned my high school class ring and wish now that I would have tried to find another source to bring in extra cash. Additionally, if you want to buy back items you pawn be aware that many pawn shops charge upwards of 20 percent to buy back the item. If you don’t care about the item that won’t matter so keep that in mind as you consider items to sell. Many pawn shops also offer loans as a way to get money now. Avoid these loans. There are far better options if you need to make money fast that don’t result in additional debt – many of which are included in this list. We’re typically against picking up a part-time job if you need to make extra money quickly. A part-time job usually requires you keep a certain schedule, and limits your income. Working for a rideshare company like Lyft empowers you to work part-time without those aforementioned issues. You get to set your own schedule when driving for Lyft and depending on when you drive, you can make decent money. Ridesharing services are popular for many needing to get around town as they can be cheaper than traditional taxis, as well as more personal and customizable. Once you’re approved to drive for Lyft, you download the app to accept riders. You can be logged in whenever you want, allowing you to work whenever you want. You can get paid in one of two ways while driving for Lyft. The first way is through traditional earnings. Your payment is based on an accumulation of the previous week’s ride earnings, including tips and net a small fee taken by Lyft. You receive payment weekly, following a Monday through Sunday work-week and can be paid via ACH. The second way to get paid driving for Lyft is if the rider gives you a cash tip. This allows you to make money right away, in addition to what you earned for completing the ride. Finally, Lyft also offers a $250 sign-on bonus for new drivers to help you to start earning money right away. It’s important to make sure your customers have a pleasant experience in your car. Engage in light conversation if they are willing. Offer extra comforts like adjusting the temperature or charging their phone. You can even provide bottles of water. Also, keep your car extra neat. Doing this can increase your driver rating and will motivate passengers to tip you. Finally, follow all traffic laws and drive safely. The last thing a rider wants is a discomforting ride. They may not tip you extra, but will likely influence how they rate you as a driver. The lower your overall rating, the less likely prospective riders will be to pick you in the future. If you’re okay driving during peak hours, you can earn more money since Lyft charges passengers more at those times. Peak hours vary based on location, but typically are evenings, weekends and during special events in your city. Also, take advantage of any incentives Lyft may offer you such as completing a certain number of trips during a span of a few days or driving during specific hours. The more trips you accept, the more dependable you look to Lyft. In return, they will send you more ride requests whenever you’re online, which makes this one of the best ways to make money quickly. You may end up in nearby towns or places that are 20 minutes away, but it’s important to be flexible when you’re driving for a ridesharing service. You’ll get more trips and earn more money driving for Lyft. The age of your car must meet the requirements of your home city. Your car needs to have four working doors, and they must operate both internally and externally. The vehicle must have at least five seat belts, and they all need to be. functional. Age varies by city, with most requiring your car be no more than ten years old. In most locations, you must also be able to pass a background check to drive for Lyft. If you want to learn about how to make money in the rideshare industry, check out our guide on how to make money driving for Lyft. How many CDs, DVDs, games, and books do you have lying around your house? If you have a lot, selling those items is one of the best ways to get money now. The two best sites to sell items and make money today are Decluttr and SecondSpin. The sites are separately run, with both allowing you to sell items you no longer use to make money really fast. Both sites work fairly similarly in how they operate. You go to either the Decluttr or SecondSpin site (SecondSpin also has retail stores at which you can sell items) and scan the UPC barcode. Once doing that, both sites tell you what they will pay for the item. The more popular the item, the more they will pay you for it. Assuming you accept their price, they will then send you a shipping label to ship them your box. This frees you from having to pay to ship, so you don’t have to deduct that from your sales proceeds. Once Decluttr and SecondSpin receive the items you’ve sold, you receive payment. They can send payment via check, direct deposit or PayPal. It is important to keep in mind that you may not make as much money selling your items through Decluttr or SecondSpin as you would be selling items on your own. However, you also don’t have to go through the hassle of having a garage sale or selling items on Craigslist. You get to find out instantly how money much you’ll make from selling your items and you can make money quickly and easily – not to mention getting rid of clutter around your house. One of the best ways to get money today is to negotiate a bill to a lower price or get rid of a membership or subscription you no longer use. We’re typically fans of making more instead of the cutting route as the latter is limited. However, if you’re wondering, ‘how can I make money quick?,’ cutting needless expenses is one of the best first steps to take. Cutting results in instant money back into your budget to go towards other needs without having to do too much work. When trying to negotiate a bill, keep in mind each that company works differently. Some may offer a long-term discount, while others may only offer a temporary reduction – such as a lower price for three to six months. Don’t hesitate to take the latter as it still allows you to get money today. If the thought of calling service providers to negotiate or cancel seems overwhelming, use Trim. Trim is a free service that securely connects to your financial accounts to analyze your transaction history. As the service notices recurring charges, it will work to negotiate a lower price for the service. They will also cancel anything you tell them you no longer use, helping you save even more money. Trim doesn’t just do a one-time analysis of your transactions. This powerful little app automatically scans your transactions on a regular basis to find money saving opportunities. The best part is that Trim is free to use. If they do manage to reduce a bill or cancel a subscription, Trim keeps 25 percent of the savings as a way for them to make money. Yes, you can do the same thing yourself on a regular basis, but Trim works as a personal assistant helping you find ways to save money all the time. Check out our Trim review to get an in-depth analysis of how Trim helps you save money. Making money delivering food is not a novel concept. People have been delivering pizza for years as a great way to make money on the side. The explosion in the ridesharing space has trickled over to the food delivery space. There are many ways to make money fast as a food delivery driver, with one of the most popular options being signing up as a driver with Uber Eats. Making money for Uber Eats works similar to Lyft. You earn money based on the number of meals delivered and mileage you drive. More specifically, Uber Eats pays you a pickup fee, a drop off fee and mileage. Like Lyft, Uber Eats pays out on a weekly basis. Uber Eats does net out 25 percent to make money, but you get to keep 100 percent of your tips. If the recipient pays a cash tip, that’s money you get now without having to wait the week. You must also have the ability to lift up to 30 pounds when driving for Uber Eats. It is important to note that Uber does allow you to drive for the legacy Uber program, as well as Uber Eats as a way to increase your earnings potential. There are numerous ways to get paid for driving your car. Don’t overlook them if you need a way to make extra money quickly that requires little skill and a flexible schedule. One of the best ways to get money now is by taking online surveys with Survey Junkie. You will not get rich quick taking online surveys. It will not replace your income. However, if you have spare time on your hands and need a way to make some fast cash now, online surveys are a great option to consider. We recommend Survey Junkie as they compensate you right after completing a survey. When you complete a survey, they give you points that can be redeemed as cash or converted into gift cards to Amazon. Survey Junkie does not charge a fee to redeem cash and has a minimal $10 payout threshold. Many survey sites make you wait longer to cash out, but Survey Junkie allows you to get money quickly without too much hassle. If you need to get cash quickly, Survey Junkie can be a great way to pad your wallet when watching TV or doing something else mindless. You may not realize this, but you can use that spare bedroom in your house to make money now when you rent it out through Airbnb. Airbnb is a site that lets you rent out part or all of your house to travelers that have need for a place to stay. You can even rent out the couch in your living room if you like and live in a high demand city. Travelers may be on a work trip or traveling for pleasure and be interested in staying somewhere that feels more “homey” instead of renting a room in a hotel. This is a great way to make money now, and is an excellent source of passive income if you have the opportunity to rent on a regular basis. There are a variety of factors that dictate how much you can make renting your room or house through Airbnb. The biggest contributor is often where you live. The higher demand your location, the more you can charge. You can also charge more if you offer certain amenities. If you can think outside the box, renting a room or a property through Airbnb is a great way to make fast money. The last thing you might think of to make money today is to go shopping. How does spending money help you make money? In many cases, it won’t, but with Ibotta you can make money through your normal grocery shopping. If you think Ibotta means you’re clipping coupons, think again. The Ibotta app is far different from clipping coupons and actually lets you easily get money quickly. If you want to make quick money in one day, take advantage of the $10 welcome bonus from Ibotta. When you claim your first cash-back offer, you earn your bonus! We already discussed selling items you have around the house in #3. However, there are other ways you can sell items online if you need to get money fast. Old cell phones are a great source to earn extra money, but you can also sell items like old laptops, tablets, and computers to earn money through sites like BuyBack Boss and Gazelle. Both sites operate similarly to Declutter and SecondSpin. You go to the BuyBack Boss or Gazelle site and scan the UPC of your item, and they tell you how much your item is worth. Buyback Boss and Gazelle buy different items, which are detailed below. As you can see, BuyBack Boss is limited to a handful of Apple devices. That aside, they also match prices offered at any other resale site. Android products – phones, tablets, etc. Apple products – phones, tablets, etc. When looking to sell items for cash, it’s best to compare different sites. As you can see, there are many available to help you quickly earn money. Swagbucks, and other similar sites let you make money in your free time. These aren’t labor-intensive tasks; these are things you might already be doing anyway. You can convert the points you earn into gift cards or cash. Cash is paid via PayPal so you can get money fast. Swagbucks also pays out a $10 bonus for new users to help you start earning. You won’t earn a lot of money with Swagbucks, but they have a low payout threshold – $3, and it’s a great way to make money in your free time without much effort. If you need to figure out how to get money fast, look no further than your closet. I’ve read reports that most people only wear 20-25 percent of their clothing on a regular basis. Do you fit into that category? If so, selling some clothes you don’t wear can be a great way to get money now. There are various ways you can sell clothing to make money. Ebay is still a popular place to sell clothing, but you may be able to make money faster by selling items on Facebook Marketplace. Do you have specific or sought-after brands of clothing? ThredUp can be a good option to sell clothing fast and make money. Think of ThredUp as a virtual consignment store. ThredUp doesn’t buy all brands, but selling to them can be a good way to make quick money and get rid of clothing you no longer wear. If you have a larger family, you can potentially make more money selling clothes – especially if you have gently worn children’s clothing. TaskRabbit is a site people use to get small and large tasks done. These are typically odd jobs in your town and can be anything from cleaning a house to something more skilled in nature. There are no real limits of the type of odd job you can get with TaskRabbit as it depends on the need of the individual looking for help. How can you make money with TaskRabbit? It’s fairly simple. You sign up to become a Tasker and indicate the types of jobs you can take and special skills. Once you do that, TaskRabbit notifies you of jobs they have available in your area – both currently and on a regular basis. When you complete the task, you invoice TaskRabbit directly, and they collect payment from the clients. TaskRabbit pays out on a weekly basis, and you set the schedule you want to work. As with other similar gigs, you often receive a tip from clients – this is money you make today and get to keep. TaskRabbit is a great source of side income, but it also works as a way to replace your job. At least 15 percent of Taskers make at least $6,000 per month, so the potential is there to make good money. If you have unused gift cards, selling them to get cash is one of the better ways to get money quickly. You can try to sell them to a friend or family member to get cash today. If that’s not an option, you can sell gift cards online through CardPool to make money. There are many online gift card resellers, but some charge fees and others won’t pay you until the card sells. Selling gift cards through CardPool is straightforward. You list the card and once it sells, you send it to them for free, via their packing slip. They send payment the day after they receive the gift card via paper check or Amazon gift card. There’s no maximum on the amount they will take and they pay up to 92 percent of the face value. Freelance work is one of the best ways to make money fast. You don’t necessarily get the money the same day you do the work, but it is a good way to get cash relatively quickly. Fiverr is one good option to pick up freelance gigs. You earn $5 per gig and can do virtually anything from writing a thank you note for someone to designing a landing page, and everything in between. You must wait 14 days for payments to clear once you turn in a gig, so this won’t get you money quickly but it can be a good source of revenue over time. Fiverr pays out via check, Direct Deposit, and PayPal. The best way to get money today is babysitting. Babysitting is one of the best ways to make money fast as parents typically pay you in cash immediately after you’re done with the assignment. You can also use the NextDoor app to find people in your town looking for a babysitter. Use Care.com to create a profile so clients can give reviews and allow you to get more gigs. If you use cash back credit cards and you need to get money fast, you can redeem points for cash. Remember that you tend to get more value redeeming for travel, but in a pinch, cash rewards can be helpful. How redemptions are handled depends on the card. Some cards will send out a check, while others will give a statement credit so you can use those funds to make a purchase. Some cards will also provide gift cards to different retailers if you prefer that route. If you’re telling yourself “I need money now for free and fast,” selling plasma may be one of your best options. I sold plasma for several months while paying off debt as a way to make extra money to throw at my debt. Selling plasma for cash is legit, and you can typically donate plasma 2-3 times per week depending on your weight and what’s in need. Most centers pay at least $20 per donation, and in some cases, you can make up to $50. In fact, many locations offer coupons that let you earn up to that maximum amount during your first few visits. If you don’t mind donating plasma and have the free time in your schedule, you should be able to make several hundred dollars per month – that’s great money if you need money now. If you’re looking for quick ways to get money, it’s time to scour your house. This likely won’t get you a lot of money, but it can be a good way to find some extra cash. If you need to get money fast, this is one of the best ways to find cash. This does require some work, but if you need quick cash today, a garage sale can be a great solution. If you live in a neighborhood that gets a lot of foot or car traffic, you can easily set up some tables to sell items you don’t need. Don’t overlook advertising your garage sale on Facebook or Craigslist for free. A garage sale may not be the best option if you don’t have a lot to sell, but if you have a lot of old electronics or gently worn clothing lying around, this can be a legit way to make fast money. You may be tempted to ask your boss for an advance if you need money now. That may only delay the inevitable with your current problem – especially if it’s debt related. Instead, ask for a raise. This won’t get you money today, but it can have a direct impact on all future paychecks. Just make sure to have a good reason for the request – telling them you need cash now may not be convincing enough. If you’re looking for how to make quick money, tell friends and family about your need and offer to help them with any needs. The ideas are limitless. If they’re close and know your need, they might be a great source of quick cash. This is a great option for the impulse shopper, or if you’ve not used an item you bought recently. If you find yourself thinking “I need money now” think through recent purchases you’ve made. Do you have an article of clothing you haven’t worn yet? Do you have a new book you want to read but don’t have the time? Take those items back to the store, assuming they take returns, to make some quick cash. Have you loaned a friend or family member money in the recent past? If so, politely reach out to them and see if they can repay you. Even if they can’t repay you the entire amount, they might be able to return part of the loan. Just remember to be polite, explain your situation and work something out that helps you both. If they can repay part or all of the loan, this can be a good way to get money quickly. Picking up side gigs around town is a great way to get money fast, especially if you don’t want to deal with the hassle of a site like TaskRabbit. Go to Craigslist and find the “Gigs” section to find potential side jobs that pay quick money. There’s a wide variety of side jobs you could pick up on Craigslist from online work to helping people around town. Just make sure the listing is legit before doing any work. The final option to get money fast is to take out a personal loan. Keep in mind; this is not a way to get money to go out and rack up debt. Taking out a personal loan is typically best reserved for someone needing to consolidate or refinance debt or to do something to their house. If you need money today, Avant is one of the best lenders to use as they have same day funds availability, no origination fees, and only do a soft pull on your credit. It’s easy to make unwise choices if you’re telling yourself “I need money today.” These poor choices may only make your current situation far worse. If you need to make money quick in one day, please avoid the below options. Regardless of what they’re called, these are one of the worst options for getting money today. Payday loan companies tell you that you can have cash today – and you can. What they leave out are the horrendous fees and interest they charge. In many States, Payday lenders can charge 300 percent interest, if not more. If you need quick cash – please avoid this option. Another seemingly innocent way to get money today is a car title loan. Car title loans are bad for one simple reason – you sacrifice your car if you can’t repay the loan. Car title loans are similar to Payday loans. They charge horrible fees and interest that make it difficult to repay the loan. If you miss several payments, you risk the lender repossessing your car – which can be bad if you depend on it for your livelihood. Even if you need money today, car title loans present more problems than they’re worth. If you’re thinking of ways to get money quickly, you may believe a credit card advance is a good option. I used to love taking a cash advance from my credit card in my spending days. It doesn’t matter if you get a cash advance from an ATM, or by going into a bank, but the fees start the moment you get cash. That’s an expensive way to get cash. Cash advances are rife with fees. You will first have an interest rate, which is typically higher than rates seen on standard purchases. Additionally, most banks charge a percentage of the advanced amount as a fee. Those fees can range between two to five percent of the amount withdrawn, or it can be a flat dollar amount. Suffice it so say, if you need money today there are far better options. Credit cards seem like a great tool if you need money right away. I know that’s how I viewed them in the past. Money was tight, and I needed or wanted something and out came the plastic. That only makes the situation worse, especially if you’re currently caught in a cycle of debt. Do you need money now for free and fast? You might think of taking a loan from a friend or family member. Don’t get me wrong, compared to the other four options to avoid, if you need quick money in one day this is not that bad of an option. In most cases, a friend or family member won’t charge you interest, and they’ll want to help if you have a genuine need. However, borrowing money is also a great way to ruin a friendship or relationship with a family member. Do you need money today? There are many legit ways to make money really quickly to help in your time of need. If you have the time, willingness to work, or a specialized skill, there’s no reason you can’t earn money now to pad your bank account. Is there a side job I enjoyed? Did I discover a hidden skill or talent? Was I able to uncover other opportunities? You may be surprised at what long-term opportunities these questions will lead to. Not only can these opportunities be helpful now, but they can also benefit you in the future. Have you’ve tried any of these side jobs to make money fast? What are some other legit ways to make money quickly? What’s one thing you would not do to get money today? 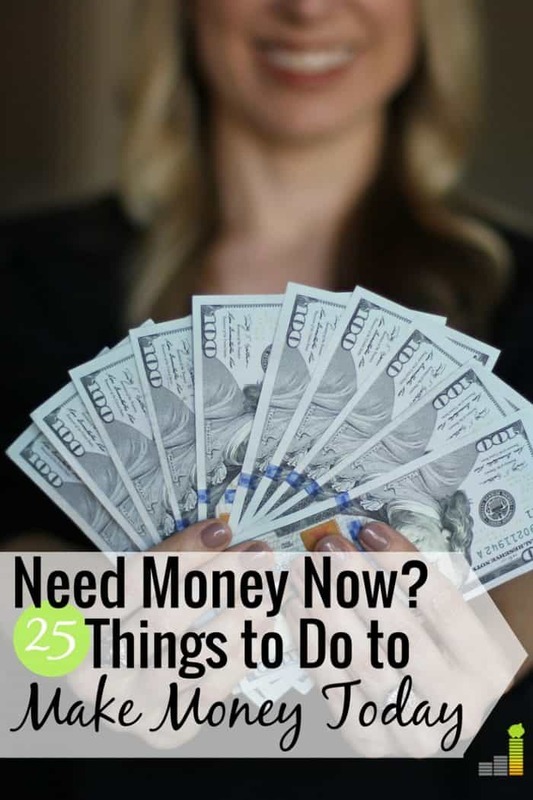 The post I Need Money Now: 25 Legit Ways to Get Money Today appeared first on Frugal Rules.